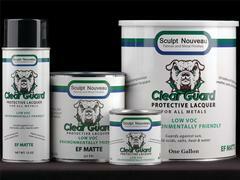 Clear Guard EF (environmentally friendly) has lower VOC and no solvent odor. It is an incredible solvent lacquer for all types of metals (contains inhibitors for Iron & Steel and well as Bronze, Brass, & Copper). Clear Guard 12 oz. spray cans are only shipped by ground.